Entry-level Android-based tablets are a relatively minor market, which is why companies offering such products tend to aim them at a specific geographical markets in a bid to avoid head-to-head competition with other makers. These devices tend to address very specific needs without trying to make a one-size-fits-all kind of device. This is exactly what the Alcatel 3T 10 tablet is all about. Equipped with a 10-inch IPS display featuring a 1280×800 resolution, an as-yet unknown SoC, 3 GB of RAM, 32 GB of NAND flash storage, and basic imaging capabilities, the Alcatel 3T 10 looks aims to be a low-cost Android tablet. Meanwhile, it has four key selling points (at least as far as hardware is concerned): far-field microphones, pre-installed Google Assistant, an integrated CAT4 4G/LTE modem (150Mbit/s DL, 50Mbit/s UL), and compatibility with Alcatel’s Audio Station designed specifically for the 3T 10. 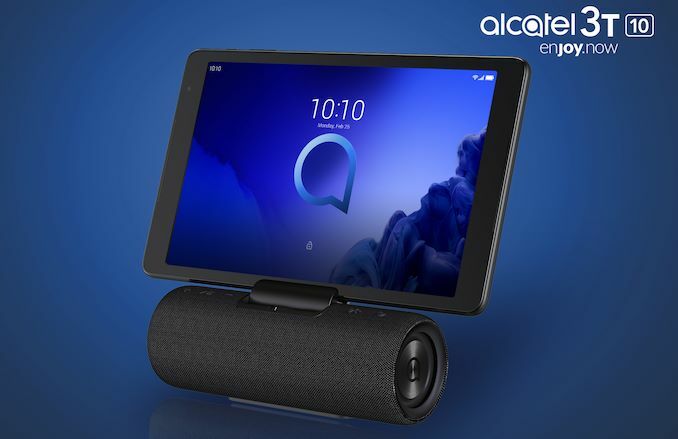 But just in case the built-in speakers are not good enough, Alcatel offers an Audio Station as a bundle – a bluetooth speaker outfitted with two 40-mm 5 W speakers. The device uses Bluetooth 4.2 to connect to the tablet, yet it also has a 3.5-mm audio jack and is compatible with any source featuring an appropriate connector. The Audio Station also serves like a stand for the Alcatel 3T 10 and can charge it using POGO pins. Meanwhile, the speaker itself charges using a micro-USB port and can playback music for 7 hours at one charge. The Alcatel 3T 10 with its Audio Station weigh just about 830 grams, they are easy to carry around and used both inside andoutside. Essentially, Alcatel positions its tablet as Google Assistant-enabled media player with 4G/LTE Internet access. Alcatel plans to start sales of its Alcatel 3T 10 sometime later this year. The tablet itself will start at €179, whereas the tablet bundled with the Audio Station will be available at €229. Obviously, such a price is a bit high for a media player, but since it can also act like a tablet, it may appeal at least to some people.